John likes to draw and paint outdoors as much as possible, gathering information and capturing the atmosphere of the day. He then either finishes the resulting work in his studio or uses it to produce studio paintings. In this film we follow him as he selects a variety of subjects including a garden courtyard, river scenes in Stratford on Avon and a peaceful meadow scene with cows. He finishes the film with a studio painting of a sketch made in Stratford. First Impressions is about recording for yourself, so that you can convey to others, a sense of place and atmosphere. In the first demonstration, a foliage-filled courtyard garden, this amounts to the surround-sound of painting. As John explains, quite a lot of editing (�artistic licence� is a phrase that gets used quite a lot) is necessary to make the scene comprehensible. John�s painting method is interesting. Beginning with a single-colour block-out of the shapes and general shading, he starts to build up the highlights, often moving about the scene � just, he remarks, as your eye does. �Never think of any mark as the final one and you won�t make a mistake�, he adds � a piece of profound advice that�s typical of the whole film. As a demonstrator, John is engaging and absorbing and he keeps up a constant narrative � in fact, I think he may be the most talkative I�ve watched. Most artists stop for a moment to think, or to concentrate on a detail, but John just keeps throwing out nuggets of wisdom that you have to absorb rather than remember. I usually manage to fill these reviews with quotes, but I�m struggling to find soundbites here. He�s very sound on the value of confidence that stems from experience and one of his first pieces of advice is to find a basic palette you can work with as standard and stick with it so that you know instinctively what mix you�re going to need in any situation. Another is never to thin your acrylic paint with water because it�ll always dry dull. Use the same manufacturer�s own medium instead. Certainly, John�s paintings have a characteristic brilliance that would seem to confirm the truth of this. Overall, there are four complete demonstrations in the film. After the garden scene, it�s a trip to Stratford on Avon to sketch a riverside view that will be worked up later in the studio, where the light and the drying times are different and require a different approach. There is also a view of the church where the changing light on water proves a challenge. A field landscape involves a journey that leads the viewer through the painting with the composition guiding the eye. I think the whole film is best summed up as being about understanding � your materials, your subject, and yourself. 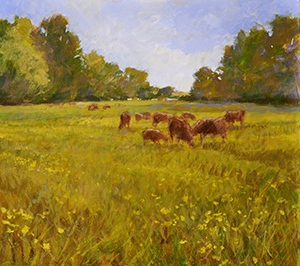 Understand what you�re painting, John says, and you could almost do it from memory. Be confident with your materials and bold with your marks (remember that advice not to think of anything as final?). �If the whole thing becomes too resolved, it�ll be like a painting of a photograph rather than my experience of being there the first time.� There, we�ve even got a quote to end on. The title of this absorbing film describes the process of understanding your subject, as John says, so that you could almost paint it from memory. John is a creative rather than a technical painter; his relaxed, confident approach comes from experience and an intimate knowledge of his materials, with which he is clearly at home, and he is keen to encourage others to become the same. His commentary is packed with hints and wisdom: stick to a few colours and understand them, don�t thin your paints with water (they�ll always dry dull), use a touch of red to make greens more neutral. The film comprises four demonstrations and John�s painting and commentary are compelling throughout. 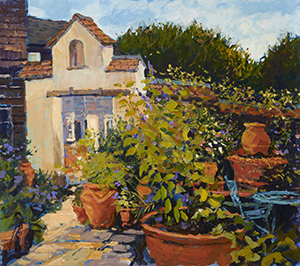 One of Britain�s leading landscape painters working in acrylics, John Hammond works in an impressionistic style, favouring drawing and painting outdoors to gather the information he needs to build on his paintings back in his studio. 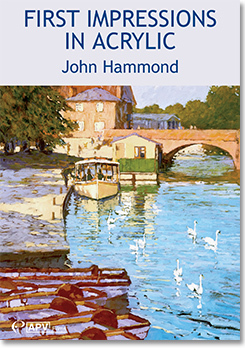 This DVD, First Impressions in Acrylic, sees Hammond in a variety of locations � a garden courtyard, river scenes in Stratford-upon-Avon (one featuring a church spire), and a meadow scene with cows. It�s the first impressions that are important here and the film provides us with an understanding of how Hammond finds his subjects and the thought processes he has to capture them in paint. He starts with large blocks of colour, building up layers and highlights, moving over the whole painting as he works. It�s this building up of layers and the purity of his colours that give his paintings such sparkling luminosity. The film finishes with a studio painting based on one of the sketches he did in Stratford-upon-Avon.